Divine Ndhlukula founded SECURICO Security Services from humble beginnings in Zimbabwe in 1998. Divine identified a need in the market for a quality oriented security company and she has driven SECURICO to become the market leader in Zimbabwe. She has tackled a previously male-dominated industry head on and her business success story is nothing short of remarkable - marking her as one of Africa's most tenacious and inspiring women entrepreneurs. 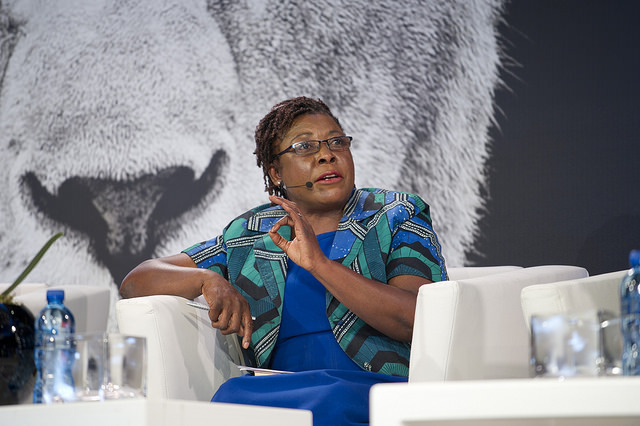 Divine is a true champion of women’s empowerment in Zimbabwe and is currently the largest employer of women in the country outside the government sector, with over 900 women employees on her payroll. From a young age, Divine had always told herself and everyone around her that she would be an entrepreneur and run her own large business in the future. This was driven by her recognition of the need to create a decent and secure livelihood for her family. Her quest to start and run her own business stayed with her throughout her formative years when she was studying and working to build her career. She set out to learn all the critical elements needed to run a successful business, undertaking various development programmes along the way, enrolling on an Entrepreneurial Development Programme in 1995. At the same time, she started researching and tracking various entrepreneurial opportunities in the local marketplace, eventually in 1998 seeing a potential business opportunity in the security services sector. Divine had identified what she saw as glaring service delivery and professionalism gaps in the private security sector, inspiring her to create and build a new type of security company with a difference. She was also motivated by a desire to empower previously disadvantaged women in Zimbabwe who were not able to access opportunities for formal employment, recognizing that the security sector had the potential to be a large-scale employer. SECURICO today provides its clients with a complete security solution - uniformed armed officers, armoured vehicles for transportation of valuables, onsite banking, trained guard dogs, and electronic security systems. The company also does private investigations, employee vetting, and security consulting. Read Divines full 100 Lionesses profile here.